Looking for something different when it comes to your next drive time solution? Sure, you want something reliable, performance-driven, and efficient. You probably also want the latest and greatest technology in your car to keep you connected at all times, and a comfortable and stylish interior doesn’t hurt either. But what about that little something extra that just pushes your commute to a whole new level? The 2019 Toyota Corolla Hatchback has got it, and we’re not the only ones who think so. Efficiency: The car must have low fuel consumption AND a low carbon footprint for its particular class of vehicle. Value: It must have a competitive price and equipment levels compared to other cars in its segment. Design advancement: It must have a “well-executed” exterior and interior as well as innovative packaging and a good selection of materials. Safety: The car must have active safety systems that help drivers avoid a crash, but also have good secondary safety systems to protect the driver in the event of a crash. Performance of intended function: The vehicle must do what the planners, designers, and engineers intended it to do. Engineering excellence: The vehicle must have clever solutions to packaging, manufacturing, and dynamics issues. It must have cost-effective technology that benefits the driver and be conceptualized and executed in a creative way. As you can see, the standard is set high for this prestigious award. Let’s see how this Orlando Toyota hatchback stacks up! Efficiency: This new Toyota dials it down when it comes to fuel costs – you’ll love the money you save with 30 mpg in the city and 38 mpg on the highway. 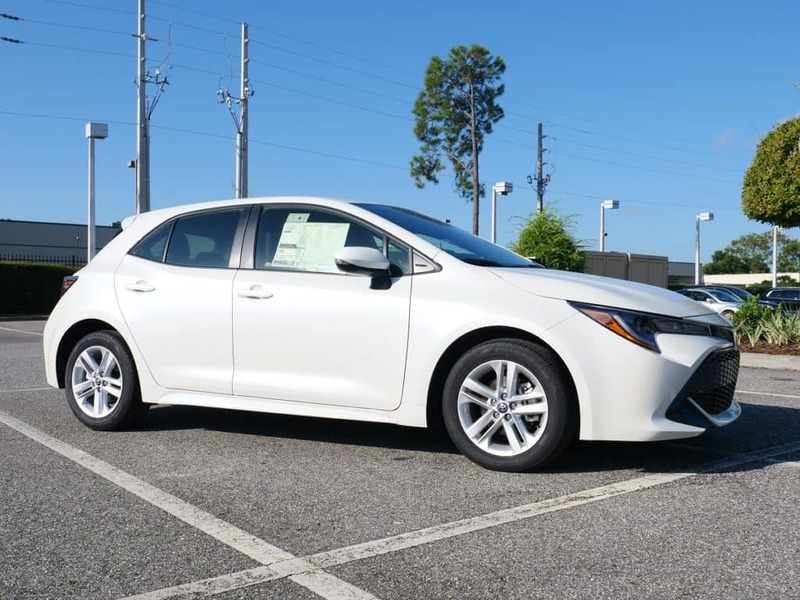 Value: This 2019 Toyota has a starting MSRP of $19,990 – exceptionally affordable, in other words – and comes in two different models, the SE and XSE, so you’ll have plenty of options. Design advancement: The interior and exterior both of this new Toyota hatchback are incredibly stylish, offering features like leather interior trim, sport seats, LED lighting, chrome exterior accents, 18″ alloy wheels, and eye-catching paint colors. Safety: The 2019 Toyota Corolla Hatchback offers Toyota Safety Sense 2.0 for active safety tech, as well as Star Safety System, an Advanced Airbag System, Safety Connect, a Blind Spot Monitor, and more for secondary safety tech. 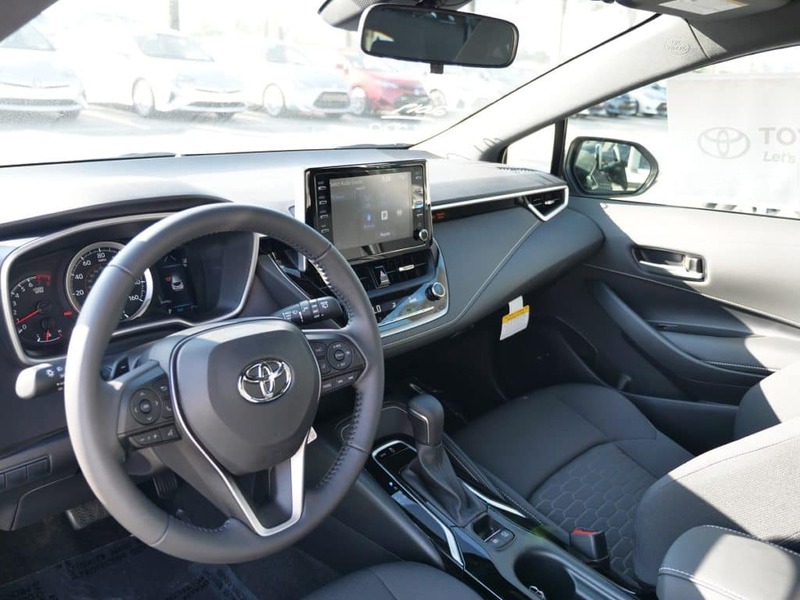 Engineering excellence: Did you know that this Orlando Toyota comes standard with features like Entune 3.0, Scout GPS Link navigation, Apple Car Play, Siri Eyes Free, Bluetooth, and WiFi Connect? And it’s all controlled via an 8″ touchscreen interface. Performance of intended function: We think the intended function of this hatchback is to provide an affordable, fun, sporty, and exciting ride to hit the road in. They succeeded. Ready to get behind the wheel? Visit Toyota of Orlando today at 3575 Vineland Road, just off I-4 near the Millenia Mall!